Hoisting plug is the connecting link between hoisting line and drill pipe so as to hang the drill rod joint or lock joint to lift the drill. It is mainly used to lift drill rods in the process of geological core drilling. This kind of drill tool has the advantages of simple structure and reliable performance. 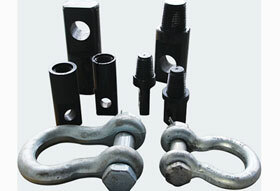 It is also used with a casing plug or adaptor to run or pull casing. Hoisting plug mainly consists of a Bow shackle, roller bearing and a tool joint thread like that used on the bottom of a kelly. It should be kept clean and the bearing and coupling threads oiled to ensure smooth spinning. This drill tool is important that the vent hole does not become blocked as this will draw the fluid from the hole as the drill string is raised. 1. It makes it easy for raising and lowering of drill rods and casing. It is constructed of premium quality components, ensuring superior reliability and safe raising and lowering of the drill string. 2. This drill tool is equipped with main hoist and designed with safety in mind. 3. Geotec Geological Equipment has a wide range of hoisting plugs which cover all your drilling requirements. It is suitable for the use with a variety of rod dimensions. 4. It adopts structural alloy steel that is heat-treated for maximum durability. 5. Additional sizes and styles are available on request. Wuxi Geotec Geological Equipment Co., Ltd. is a professional manufacturer and supplier of drill tools in China. Through more than 20 years’ production experience and marketing experience, we have gained the recognition of a large number of clients both home and abroad. In addition to hoisting plug, our company also supplies all kinds of geological drilling tools, such as diamond core bits, core barrels, rod taps, and so on. Located in Wuxi, near Shanghai, the biggest port city of China, we enjoy convenient transportations of any kind, by land, sea or air, which will greatly reduce your transportation cost. Our drill tools have been widely exported to America, United Kingdom, France, Canada, Australia, New Zealand, Indonesia, India, Russia, Malaysia, Thailand, Mongolia, Pakistan, etc. If you are interested in our hoisting plugs, please contact us. We are looking forward to cooperating with you.